The evidence of a link between oral health and overall health is constantly growing, and in a new study from the University of California, a connection may have been found between the frequency with which you brush your teeth and onset of dementia. In the study, the behavior of more than five thousand elderly people was followed over a period of eighteen years. What was discovered was that those who did not brush their teeth every day were sixty-five percent more likely to develop dementia than the participants who kept up with a daily oral health regimen. This is not the first study, however, that has uncovered this sort of evidence. Previous studies have shown that the bacteria involved in gum disease is found in higher amounts in the brains of people who have Alzheimer’s. Although it is not yet known exactly how this happens, it is thought that the bacteria gets into the brain through the blood stream and causes inflammation in the brain or even brain damage. Although it certainly cannot be definitively concluded just yet that brushing your teeth will save you from dementia, there are so many benefits to keeping up with good oral hygiene that it makes sense to do it for many reasons. First of all, there’s the direct connection – brushing and flossing to protect your teeth and gums. This can help keep tooth decay and tooth loss at bay, and can help prevent things like bad breath and tooth discoloration. Then there are the issues of gum disease and what it can lead to. Gum disease bacteria has already been linked to diabetes, heart disease, and circulatory problems. 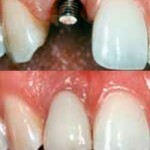 Of course, it can also cause major problems in the mouth, as the gums are responsible for holding the teeth in place. As more and more studies like the recent one at the University of California come to the surface, the hope is that people all around the country will sit up and take notice and do something about the state of their oral health. It does not take a lot of effort to brush and floss daily, and the benefits of doing so can be felt throughout the body. It’s a very small investment for a huge return, so if your habits leave something to be desired, it’s never too late to turn over a new leaf and do something positive for your health.